Rolling Pins There are 4 products. American rock maple rolling pin, 38cm / 15" length and 7cm / 2¾" diameter. Perfect all-around, multi-purpose rolling pin for your kitchen. American rock maple French rolling pin, 51cm / 20" length. With it’s tapered ends, is the preferred tool for rolling out thin pie crust. American rock maple Bakers rolling pin, 49cm / 20" length. 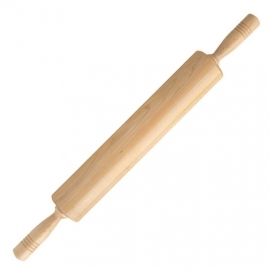 Classic bakers rolling pin allows for a more tactile experience and is the prefered choice by many professional bakers. Taylor's Eye Witness stainless steel rolling pin with silicone handles.